There were roadworks near GZ when placed so please be careful. There is some evidence of Methwold having its origins in the Bronze Age in that there are records of remains, dating from around 2,000BC, being found in Methwold itself and the adjacent Fens. The settlement appears to have begun beside a river or stream on the lower edge of sloping chalk land, overlooking the fen. 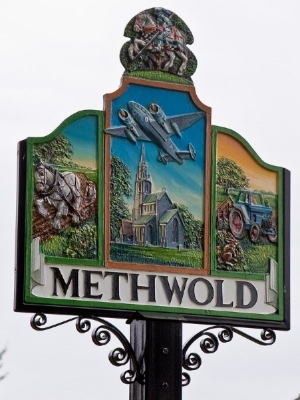 The settlement was populated by the Romans and later the Anglo Saxons from whom it gets its name "Methelwaud" because it is the "wold" or high land situated in the middle, between Hockwold and Northwold. The village sign shows the connection to Methwold's farming community, along with St Georges Church and RAF Methwold. During the Second World War planes returning home would line up on St Georges church before landing at the temporary RAF base, which was open from 1938 - 1958.